Any garden fail is, of course, an opportunity for something new. Here are a few of this year’s fails, with notes on what to do next time. First, the Tuscan kale that I smuggled in from Tuscany looked fine for a while, and I should have harvested it while it was thriving. Instead, I waited, and some creatures got there before me. 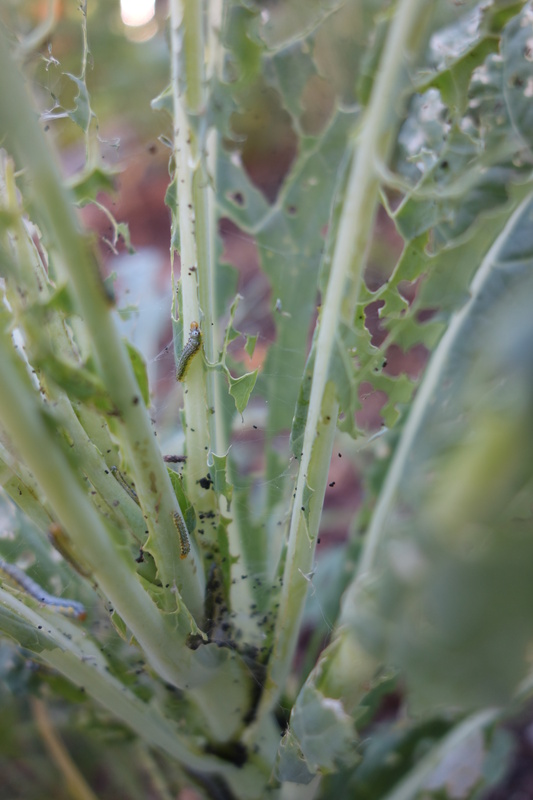 Flea beetles?? This one is not a big fail, just a not very interesting use of this coleus. 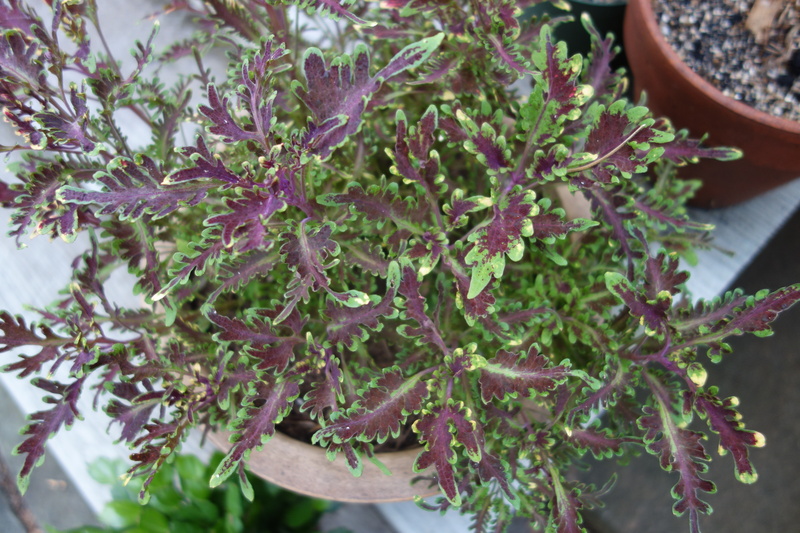 I think its delicate shapes and colors would be more effective against a stronger color rather than all alone in a pale green pot. 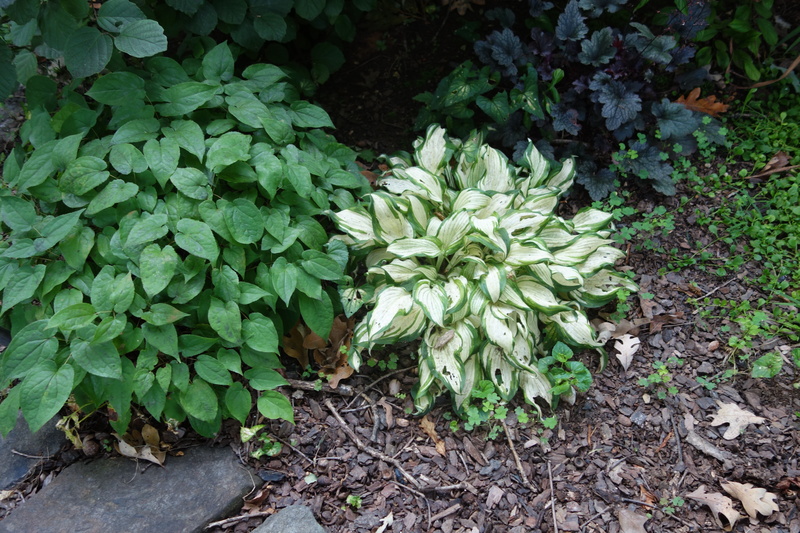 These variegated hostas (there are a few more under the oak tree) were pass-alongs from Sara Toye, and I appreciate her generosity. But I used them as fill-ins until something better came along, and that time is now. 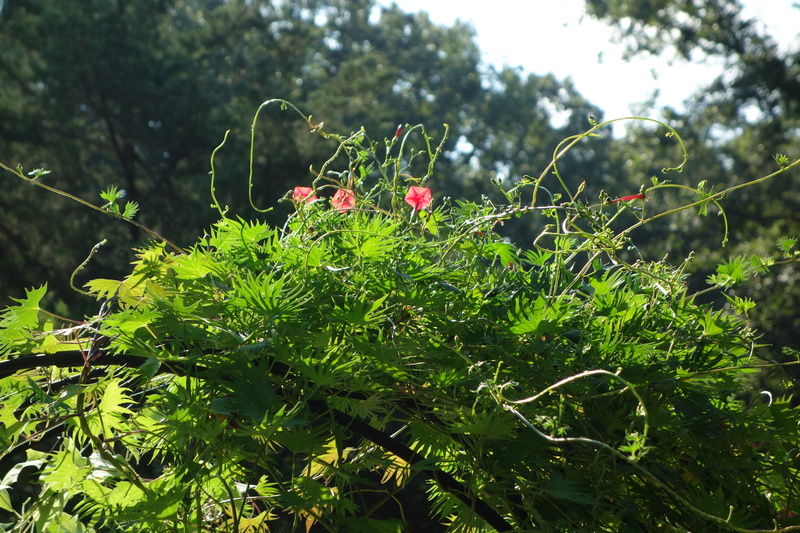 The one in this picture is being crowded out by a much more interesting epimedium rubrum. Plus, their leaves are looking ratty in a year when most hostas are looking gorgeous. Off with their heads, I say! This is not a fail so much as a realization. 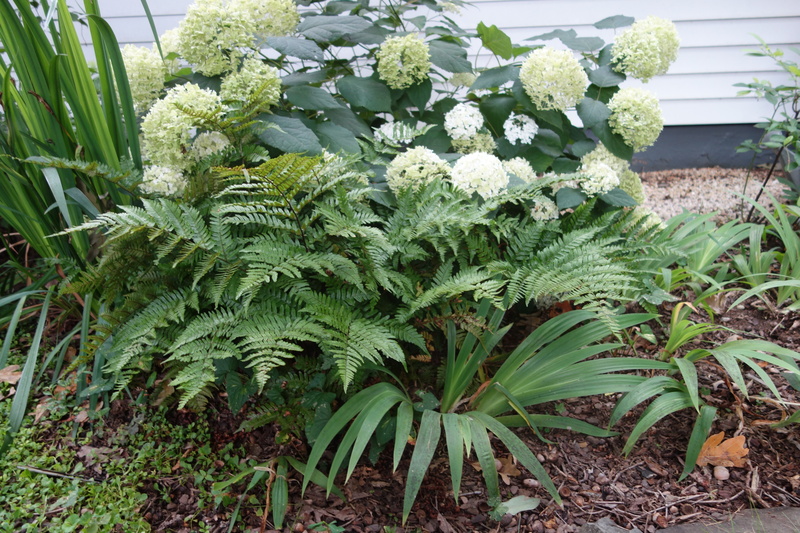 The ‘Annabelle’ hydrangea has gotten so big that it overtops the autumn ferns. Admittedly, in the winter and early spring, the ferns will look fine, but they have a better life planned in front of the compost fence, where I have already planted three this spring and find them perfect. This coroepsis ‘Full Moon’ is too tall in front of the yews. I admit that their flowers twine charmingly around and about, but the scale is off. Their future lies in the sunny garden, where they can twine to their hearts’ content. This butterfly bush was fine for a couple years, another pass-along that I intended to replace this fall. 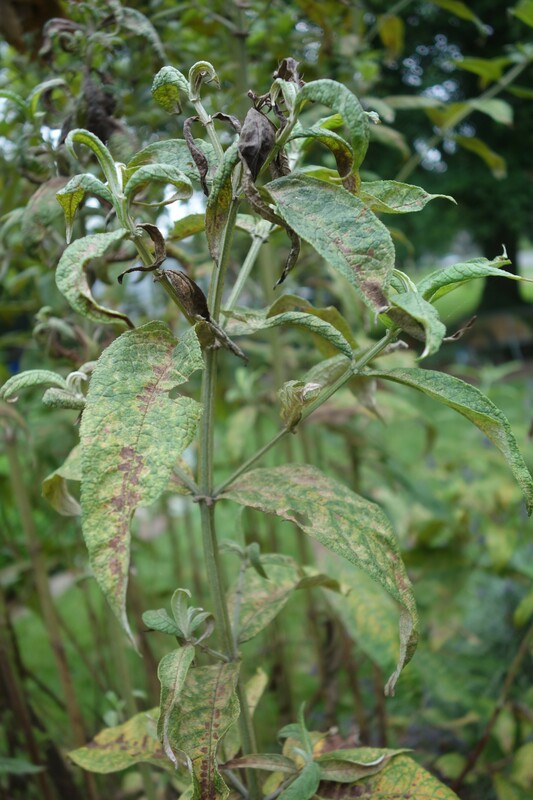 Perhaps knowing its fate, it decided to succumb to powdery mildew (I think) and has been very unattractive this year. Goodbye, bush! 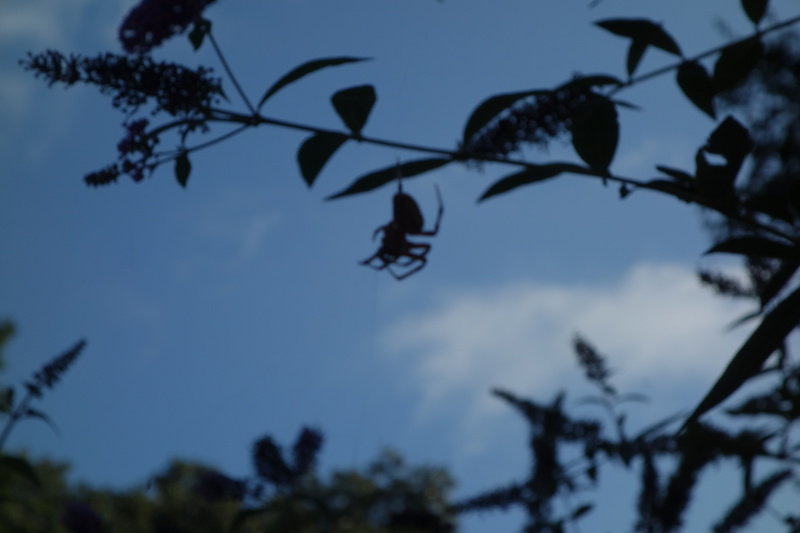 Now I have to make a decision about what will take its place (vitex, Japanese maple, wild cherry, smokebush, etc. etc.). On a happier note, here are a couple rescues. 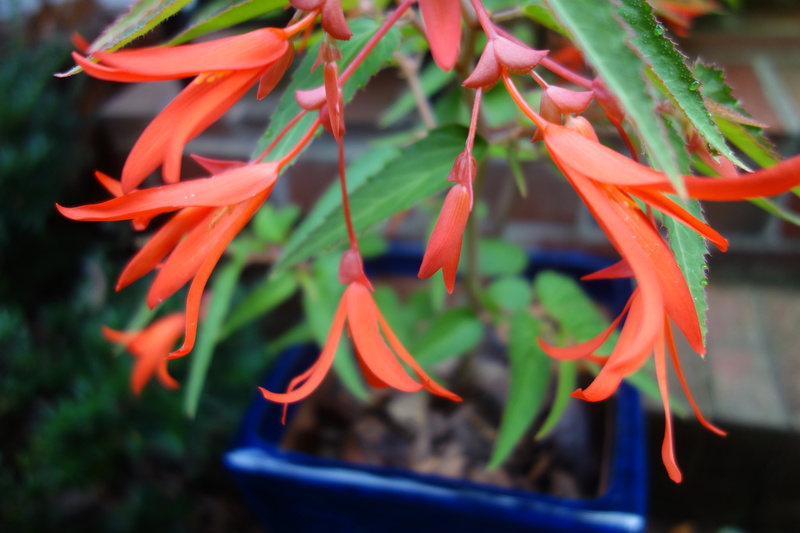 First, this begonia ‘bonfire’ was one of three I grew last summer. I tossed two and kept the third in its pot and placed the pot in the shed. To my surprise, it was trying hard to grow when I pulled it out this spring, and it has come happily back to life. Win! 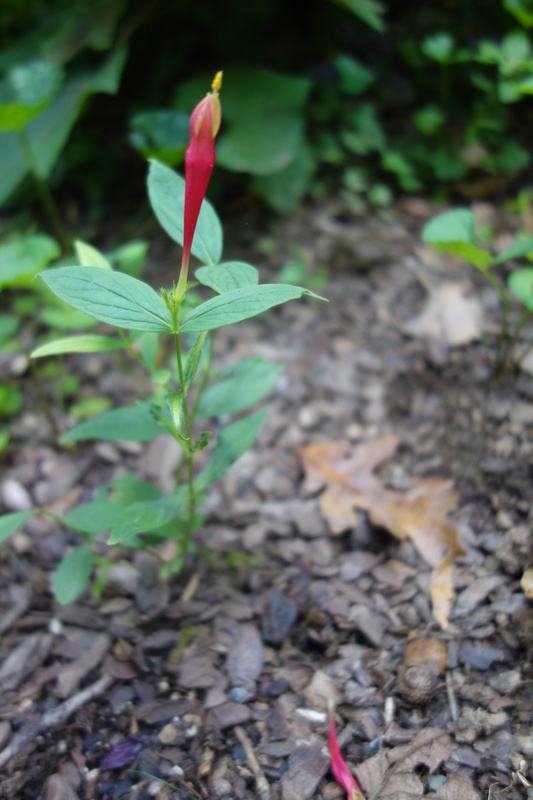 The other rescue is an Indian pink that I planted last year in the corner garden. The over-enthusiastic man who got rid of my leaves used his chopping machine to chop away at plants, not realizing they were intentional. The hellebores he slashed came back fine but I had given up hope for this. Then, while tidying up this bed (weeding and mulching), what should I find but a tiny little bloom. 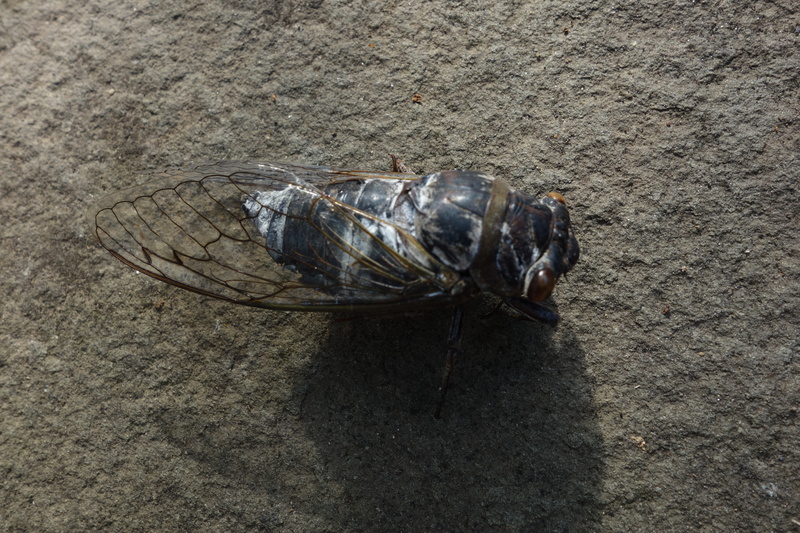 If it had not appeared, I’m sure I would have weeded this, too. Now I have hope that it will survive and thrive in the years to come. 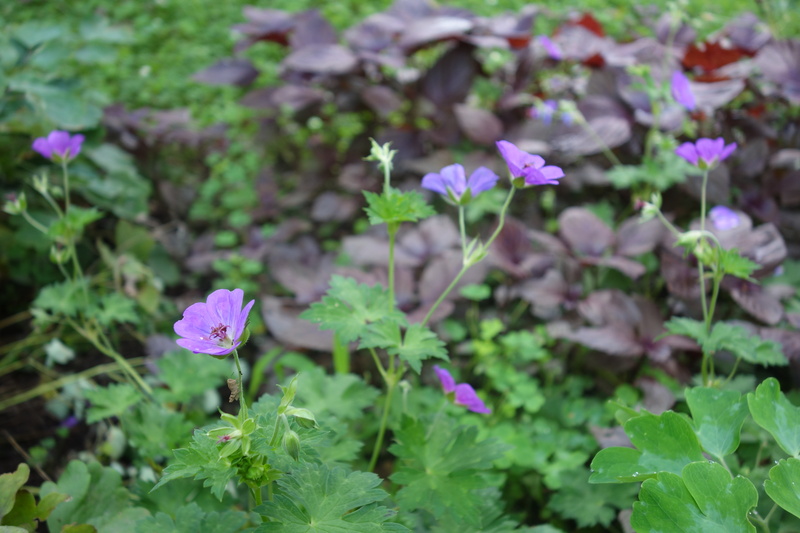 Finally, I have had bad luck with geranium ‘Rozanne’ despite its being touted everywhere as a perfect plant, perennial of the year, and so on. I’ve planted at least three and lost them all – until this year. Here is ‘Rozanne’ twining happily among the perilla in the walkway garden. 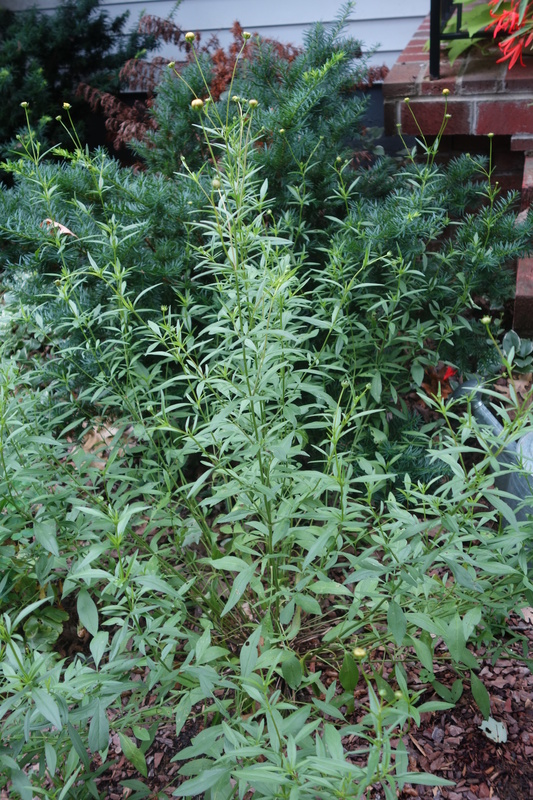 Who knows if it’s been too dry, not sunny enough, or what, that it’s never done well before, but I felt better after reading this blog post about how another gardener in northern Virginia has had the same bad experience. Perhaps this year’s rain has given it (and me) hope, but I won’t blame myself if it never comes back.